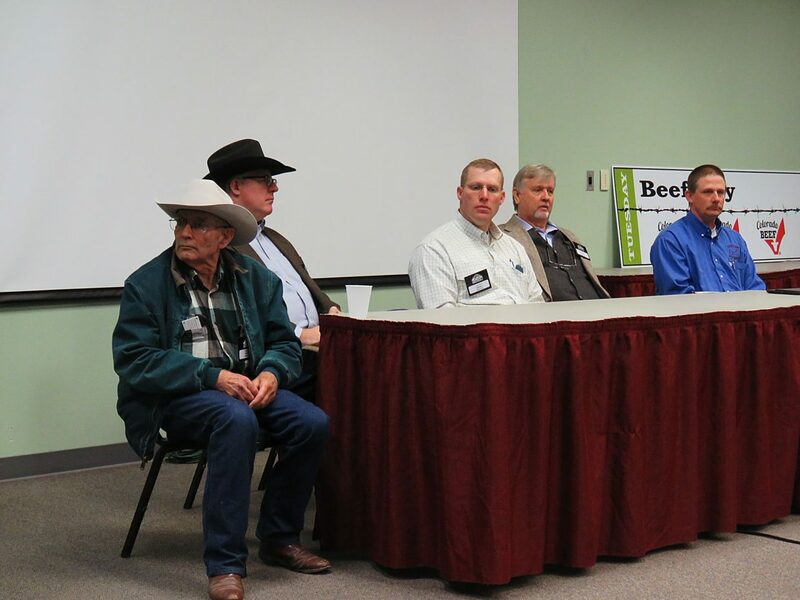 Kevin Oschner moderates a panel of beef industry representatives during Beef Day at the Colorado Farm Show, including, left to right, Chip Hines, Lee Leachman, Cody Peck, Stan Bevers, and Kevin Miller. “The Ranchers Vow” earned speaker Chip Hines more than a few chuckles during Beef Day at the Colorado Farm Show. Unfortunately, for many in the beef industry, the words hold true. Hines, author and retired rancher from Yuma, Colo., said towards the end of his presentation on “Remodeling the Cow-Calf Industry,” that young people are needed in the business if it is to survive long-term. Hines said producers need to get back to the basics of production, instead of making cows bigger, which has increased costs. He shared a study from the University of Wisconsin in 1983 that showed smaller cows can wean more pounds than larger cows. “This study was done when the industry was already headed toward producing larger cows, why weren’t we listening to this research? Now, 35 years later, we are heading back to the smaller cow,” he said. Hines said producers have spent too much time focusing on milk production, which has contributed to higher energy requirements and production costs. He shared some data from New Mexico State University that indicated higher milking cows of the same weight require nearly 800 pounds more forage a year. “In a 100-head cow herd, 10 more cows could be added for the difference in milk production,” he said. “Every increase in production that makes the cow do more than she is capable of is a cost,” he said. At one point, the industry was focused on producing leaner cows with little backfat. “They were harder to breed back and they didn’t winter well,” he said. Jones said producers should find a representative they really like and can work with, that will do a good job for them. “You want to form a long-term relationship with them,” he said. Pick a representative that can really sell what you are doing. You want someone who can sell your ranch. It doesn’t matter if you have 10-15 head, if you do the work, the calves will bring the market price,” he said. Derner talked to producers about becoming more proactive, and having a plan in place for weather and fire issues. “About half of the producers who are proactive rest pastures, half use conservative stocking rates and some incorporate yearlings into their stocking program,” he said. With a hot, dry spring predicted, Derner showed producers how a drought can be used as an opportunity, as well as a challenge. 1. Anticipate it with conservative stocking rates. 2. Predict variability using weather climate forecasting. 3. Track variability with flexible stocking rates. 4. Use spacial variability that already exists in the landscape. 5. Determine what could be done to create variability in the operation. Derner said producers can strategize to create flexible stocking rates by incorporating yearlings into the cow/calf operation or retain more heifers in the fall. Producers can also graze dry cows during the late spring and summer to add value. All three strategies involve animals that could easily be relocated or liquidated in case of a drought. He said it is important for cow/calf operations to develop a plan so they don’t have to liquidate cows. “In most cases, it took years to develop the genetics you have. Find ways to create some flexibility in your operation, so your only choice isn’t selling cows when there is a drought,” he said.